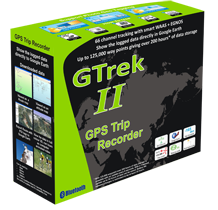 Currently the Gtrek's will communicate with a PDA or Smartphone via either Bluetooth (mono-directional), or by USB cable (bi-directional). Please note due to limitiations imposed by Apple iPhone and iPad products are excluded. The PC software supplied, will allow basic tracking of route and display of route feautures, (speed, distance et cetera) on a suitable PDA but will not allow route overlay onto Google Earth. A PDA and Smartphone version of the software is currently under development and will be available when fully developed. Up to 22 hour operation on one battery recharge. Smart power management. Auto sleep and wake up provides 360 hours power on standby in Bluetooth mode. Bluetooth 1.1.1.2 and 2.0 support for fast data transfer. (1.2 SPP profile range up to 15 metres). (One way only to a PDA or Smartphone). Bi-directional cable communications support standard NMEA-0183 V3 transfer at 115200 baud to PC, PDA or Smartphone.